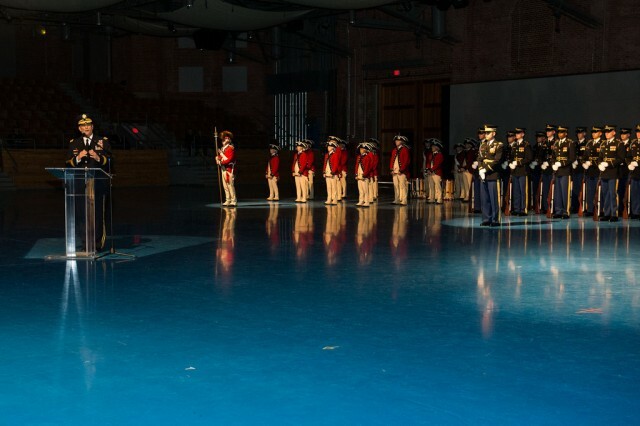 JOINT BASE MYER-HENDERSON HALL (Army News Service, April 16, 2015) -- Five civilians were presented with the Outstanding Civilian Service Award for their contributions to the Army during a special Twilight Tattoo hosted by the Army chief of staff, April 14. The third-highest medal the Army can bestow on a private citizen was pinned on the lapels of television host Stephen Colbert, retired Major League Baseball commissioner Bud Selig, Wreaths Across America founder Morrell Worcester, Matthew Zames of JPMorgan Chase and D. Scott Davis of UPS. 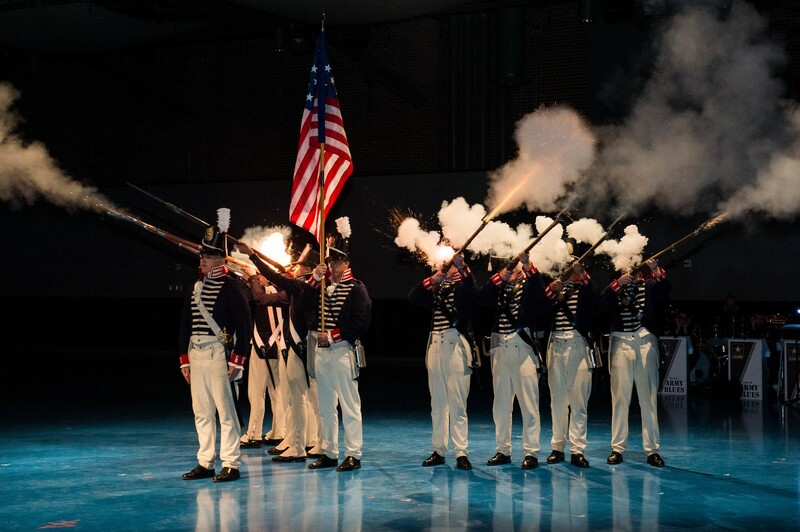 Before the hour-long military pageant that takes the audience through the history of the Army with Soldiers re-enacting the service's roles from the American Revolution to the present, Army Chief of Staff Gen. Ray Odierno took center stage in Conmy Hall. 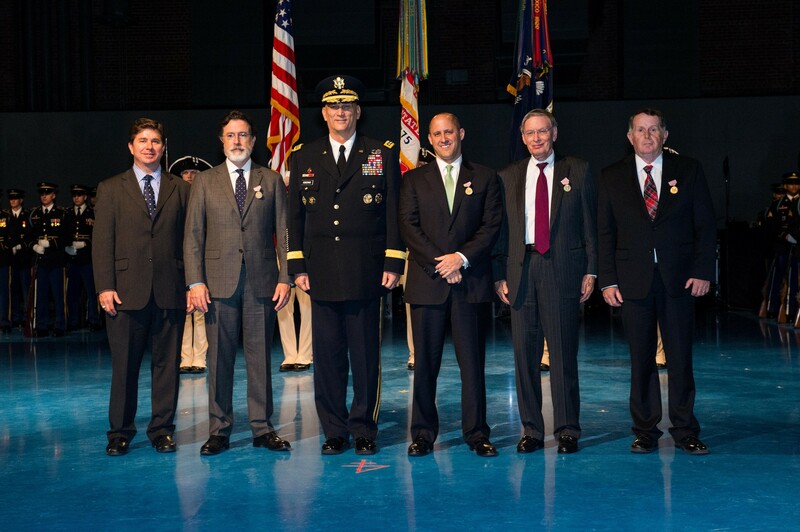 He thanked the five men who "taught us all lessons about service." 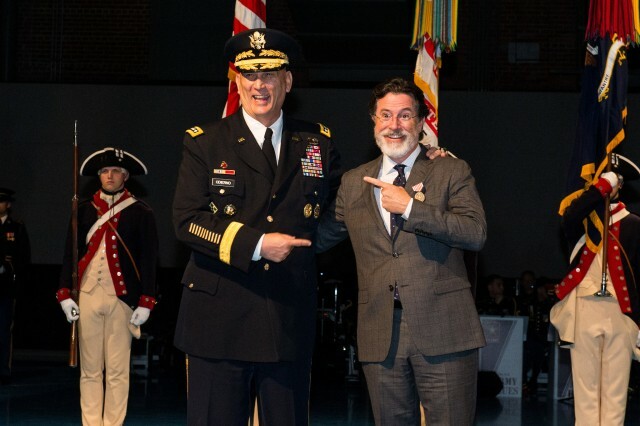 Odierno said Colbert had entertained the military nightly through "The Colbert Report," directing donations to the Yellow Ribbon Fund and promoting the First Lady Michelle Obama's "Joining Forces" initiative. He helped link the American public to the military by creating a shout-out to honor any Service member who sent in a flag. "What we all remember best is Operation Iraqi Stephen Going Commando in 2009 when he underwent so-called basic training, wore a uniform that resembled a bad knock-off Brooks Brothers…while he entertained our troops for a week," Odierno said. "What I want to reflect on was when Colbert made the strongest show of solidarity with our troops -- when he sacrificed his most valuable possession - his hair - I have to say, this was one of the highlights of my tour," Odierno joked. "Stephen's show has become an iconic part of American culture, but more importantly, it helped to maintain the bond that connects our communities with our military, hoping to share the military story and what it means to live a life of selfless service for our Service members, families and veterans alike," he said. In a brief interview before the ceremony, Colbert told the story of how he found out about the award. My first reaction, when I heard, was: I can't take that; but I will as a reminder of how much more there is to do," he said. "I'm a fan of the Army - a couple of my brothers served in the Army, my dad was an Army doctor and my uncle was in the 101st Airborne on D-Day - so, I've always been aware of the gratitude we should have for those who answer the call to protect the country. "When you thank someone for serving, go beyond, continue the conversation," Colbert said. "Thank you for your service should be the beginning of the conversation and not the end." Retired Major League Baseball, or MLB, commissioner Bud Selig was also honored by Odierno for his leadership and dedication to Soldiers and their Families through the Welcome Back Veterans program, which raises awareness and support for the needs of vets and their Families. More than $20 million went to university hospitals and helped to transform the lives of countless veterans and their Families by providing ongoing treatment for those suffering from post-traumatic stress disorder. "Under Bud's tutelage, Major League Baseball also honors Soldiers and their Families on the home front," said Odierno, adding that MLB has surprised veterans with tickets to the World Series and donated hundreds of thousands of dollars to funding a housing complex for homeless veterans. "No matter where you go, you'll find Major League Baseball reaching out to Soldiers, veterans and their Families," he said. "Your personal leadership has made a real difference to all of us who serve in uniform." Following the Twilight Tattoo, the ninth commissioner of baseball and now commissioner emeritus of baseball, Selig, signed baseballs, bats and a few Milwaukee Brewers caps for fans. He had owned the Brewers at one time and still makes his home in the namesake city. "I was in the Army from 1956 to '57 stationed at Fort Leonard Wood, Missouri," he said. "The Army has always been my favorite branch of service and watching all of this today and receiving this award meant a great deal to me and was really very emotional. "The best part of being in baseball and something I've always said to people, it isn't a responsibility to do things like 'Welcome Back Veterans,'" he said. "If you're lucky like me, you know that it's really a privilege, so when you receive an award like this, it just inspires you to want to do more." When he was 12, Morrell Worcester visited Arlington National Cemetery while on a field trip from his small town in Maine. The experience left an indelible impression that stayed with him as he made a successful business of his wreath company. "In the winter of 1992, he found himself with a surplus of wreaths and remembering his boyhood experience, he shipped those left-over wreaths to Arlington National Cemetery," Odierno said. "This tradition went on for years until 2005 - when a picture of Arlington adorned with wreaths covered with snow went viral. "It was then that this annual tradition to honor our Service members and our fallen heroes began to grow," he said. "In 2010, Wreaths Across America and their national network of volunteers laid over 220,000 memorial wreaths at 445 locations in the United States and beyond… the work that Morrell Worcester and Wreaths Across America does… is a shining example of the difference one determined individual has made in the support of our military and their Families." Anyone who has seen Arlington National Cemetery during the Christmas holiday season cannot miss the thousands of headstones with evergreen wreaths adorned with red bows resting against them, placed by volunteers. Worcester said the tradition started as his family's personal gift to the military and what the military has done for the country. Then he said, it just caught on and now has a life of its own. "Our goal for this year is to place one million wreaths on headstones of the fallen across the United States and overseas," he said. "We have more than 1,000 locations now including 24 overseas cemeteries." Chairman of the Board of Directors of UPS and former UPS CEO D. Scott Davis was recognized for creating a culture of support for veterans, veterans' organizations and veteran programs that went back to his time as UPS chief executive officer in 2008. "During Scott's tenure, UPS has employed over 25,000 veterans and has pledged to hire an additional 25,000 more over the coming years," Odierno said. "Scott has pledged 25,000 employee volunteer hours to help veterans and veterans service organizations and not only is he hiring and volunteering, but Scott is encouraging our veterans to lead within UPS and endorsing new opportunities for honorably discharged veterans." Odierno next paid tribute to JPMorgan Chase Chief Operating Officer Matthew Zames, who formed an alliance with other major corporate employers and committed to hiring 100,000 veterans. Having accomplished that objective, the alliance is now working to double that to 200,000 vets. "JPMorgan Chase has not stopped there," Odierno said. "Supporting our veterans through housing assistance, education assistance and volunteerism and their debt-forgiveness of Gold Star Families, are just a few of the many other things that have made JPMorgan Chase a true leader in corporate support to our veterans. "Matt, your contributions to our service men and women have had a profound impact on them, their Families and the U.S. Army," Odierno said. "You have reminded us all of the meaning of kindness as you honor those who serve and sacrifice."